Here is biggest announcement of the day. 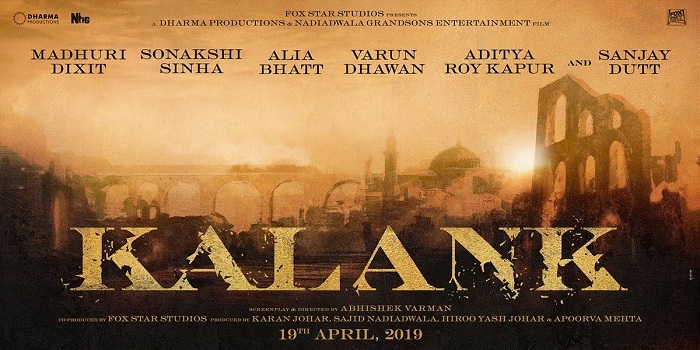 Kalank is set to be directed by Abhishek Varman and produced by Dharma Productions, Nadiadwala Grandson and Fox Star Studios. Film has an ensemble star cast of Varun Dhawan, Alia Bhatt, Sanjay Dutt, Madhuri Dixit, Aditya Roy Kapur and Sonaskhi Sinha. Film is slated for release on 19 April, 2019 in exactly one year time. Kalank is earlier planned 15 years ago by Karan Johar and his dad Yash Johar. Film is set in the period of 1940s.